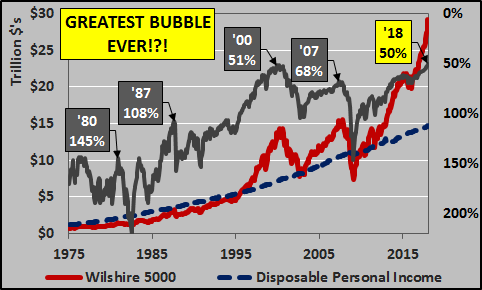 When compared with disposable personal income, the stock market has never been in the midst of such a valuation bubble. Ever. In fact, it’s not even close. One more look but from a different perspective. 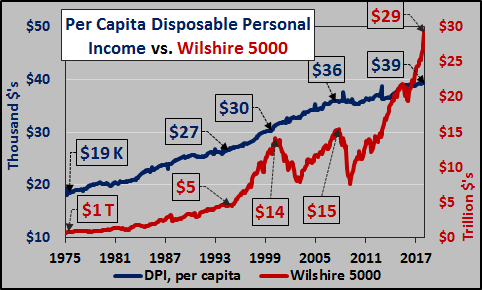 Real disposable income on a per capita basis versus the Wilshire. Again, asset prices have de-coupled from incomes. Of course, most of the income gains are due to a tiny fraction and are not representative of the reality of flat to declining real incomes for the vast majority of households. A stock market boom born of government-driven debt stimulus can’t run in the face of directly contradictory fundamental metrics forever. More and more basic data point to an inflection point coming sooner rather than later.